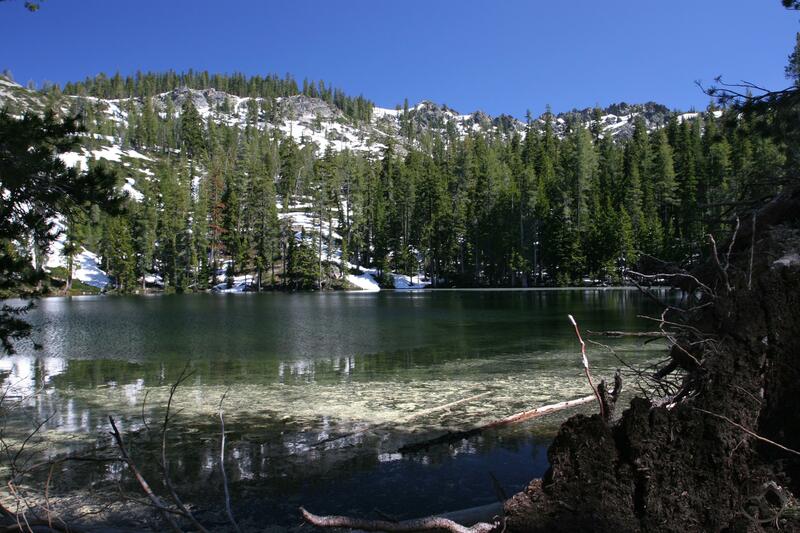 An exceptionally scenic yet easy hike to a beautiful lake basin with numerous lakes and lots of potential for exploration. Looking down on Cliff Lake. 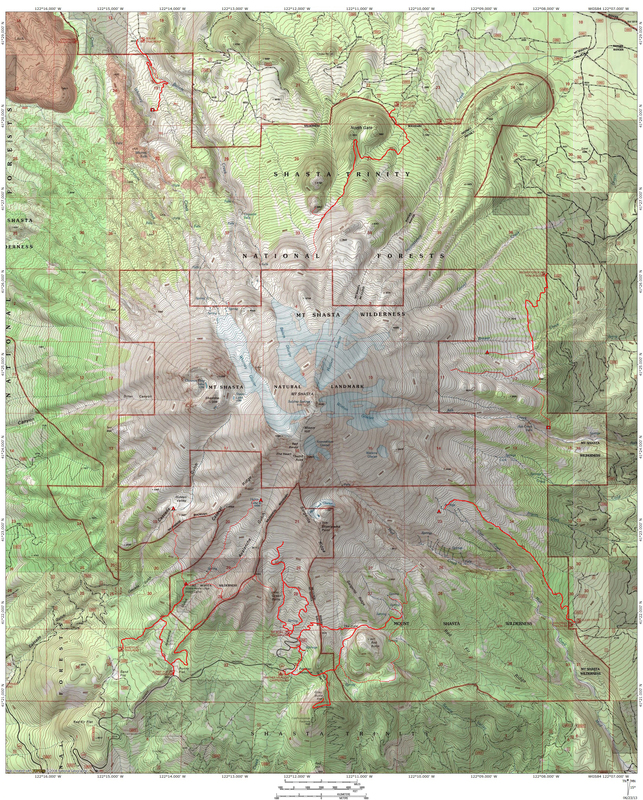 The Mount Shasta region has an overabundance of great hikes and exceptional scenery. It should come as no surprise when a real gem of a hike slips through the cracks and is generally neglected by hikers. What is surprising is that such a gem could be as spectacularly scenic as Cliff Lake. This deep, blue lake is one of the most beautiful lakes in the area. As the name implies, there is a magnificent cliff rising out of the lake and soaring 1,500 feet above the alpine waters. Compounding Cliff Lake’s scenic qualities is the presence of four additional lakes in the giant basin. Two of the lakes, Cedar and Lower Cliff Lakes, are passed by the trail en route to Cliff Lake. The other two, Terrace and Upper Cliff Lakes, are high above Cliff Lake, nestled in cirques tucked into the rocky cliffs. Upper Cliff Lake in particular is in an especially high and rugged bowl, inaccessible to all but those willing to scramble off-trail over rugged terrain. Adding interest to all of these fantastic features is the proliferation of Port Orford Cedars. This extremely rare species of tree has a high concentration around Cliff Lake, leading to the basin being unofficially referred to as Cedar Basin. Perhaps the most surprising attribute about the Cliff Lake area is that it is not well known beyond local hiking circles (this hike was included in a lightly distributed botany focused hiking guide, the only mention of the lake in a book to date). Though Cliff Lake may have to be shared at times, it is typical to find no one at the lake at all. Isolation is almost guaranteed at Terrace and Upper Cliff Lakes. Adding to the surprise that Cliff Lake is not as well-known as it ought to be is the lack of effort it takes to get there. 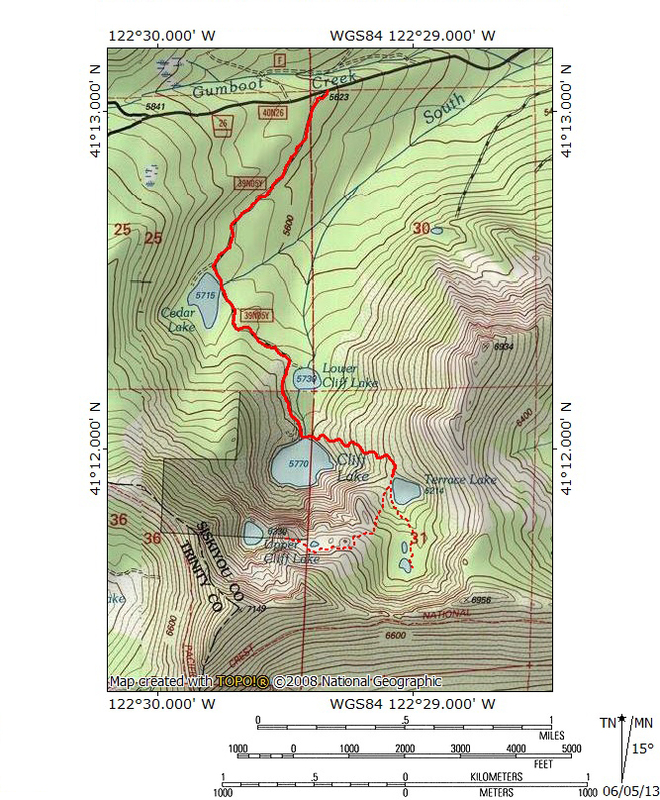 The lake is only 1.5 miles of easy hiking off of a paved road only a few miles outside of town. Having expounded the superlatives, two caveats need to be pointed out. The first of these is a dirt road rather than a singletrack trail leading to the lack. 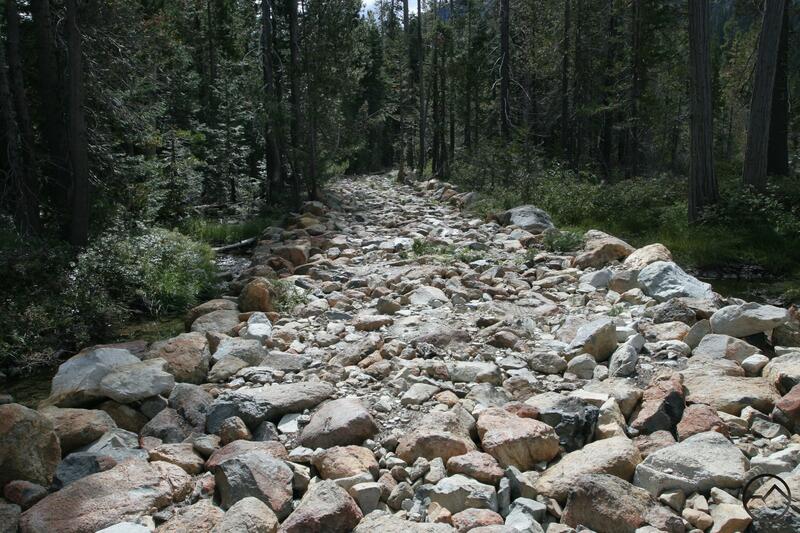 The road is very rugged, with one stretch being composed entirely of large boulders for about 70 yards or so. It would take great patience to negotiate a vehicle up this road. This almost never happens, but there are rare occasions where one hikes into the lake and finds a car at the end of the road. The other caveat to be aware of is the presence of a large block of private land at the lake. The entire west half of Cliff Lake and lands surrounding it is privately owned. There are a couple of cabins and a few out buildings on the land, as well as an odd dock constructed of large, floating, logs. Please be respectful of the property owners and do not trespass. A good rule of thumb would be to stay on the east side of the outlet creek, where the national forest owns the land. The rocky causeway passing Cedar Lake. The parking area right off of South Fork Road is large enough to accommodate several cars though there it is rare for any vehicles to be there. Park in the large clearing and simply begin hiking down the road. It is very level as it passes through a mixed forest of cedar, ponderosa pine and various firs. Tough they are not quite as dense at the beginning of the trail as they are around the lakes, be on the lookout for Port Orford Cedars. These trees are technically cypress trees rather than cedars but the foliage does resemble that of a cedar. Some of the most distinguishing characteristics are the blue tint of the sprays and the blue and red cones that form on the spray’s tips. Continuing down the road, the grade is almost non-existent. There are a few creek crossings but none of the streams are large and will most likely be dry by mid to late summer. About 0.75 miles from the trailhead, the forest around the road opens up as Cedar Lake comes into view. 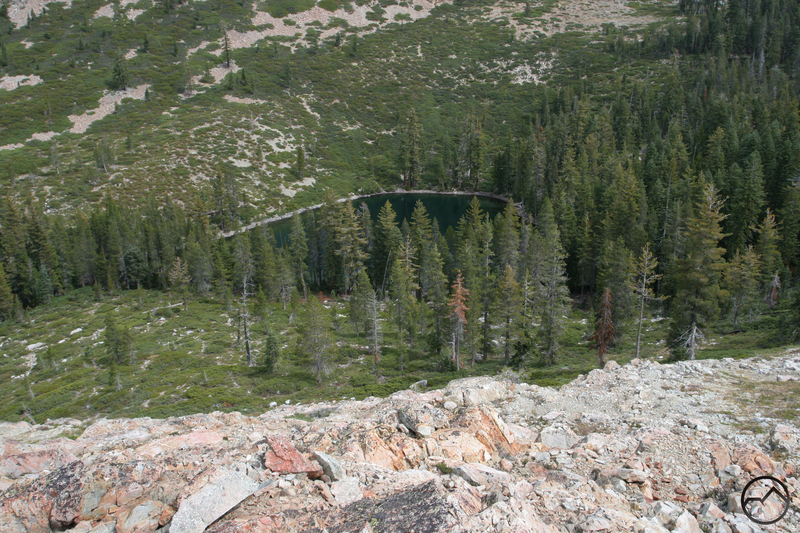 This lake is the shallowest of all the lakes in Cedar Basin. There are some good campsites around the lake for those inclined to camp, though there are better sites ahead. The road skirts the northern end of the lake before coming to an impressively built rocky causeway. The outlet of Cedar Lake has created a very marshy area and in order to cross it the road has been built up by piling up large boulders. Driving over this section would not be fun but walking over it is easy. Port Orford Point and Lower Cliff Lake. Beyond the causeway the trail veers away from Cedar Lake and makes the only noticeable climb of the entire hike to Cliff Lake. It is very short and only gains about 100 feet. Once past the grade Lower Cliff Lake comes into view. 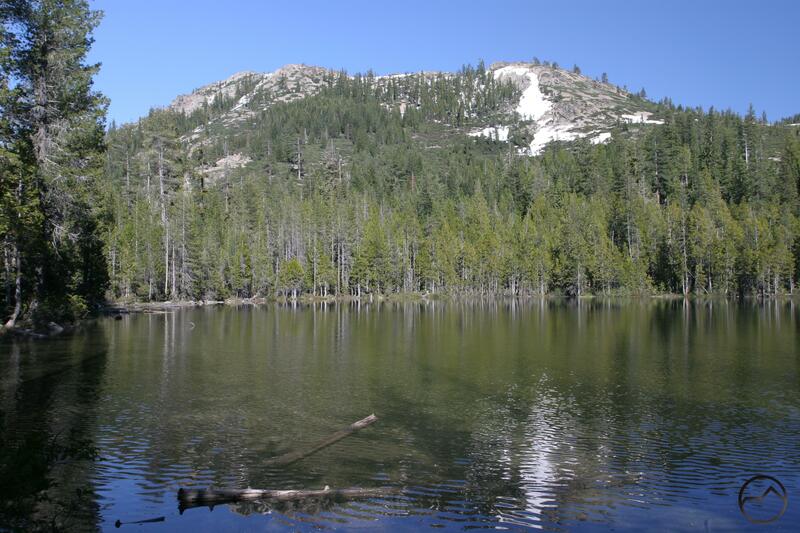 It is smaller and deeper than Cedar Lake and is backed by an attractive peak on its east side. This peak has a much more impressive appearance while driving up South Fork Road, though it is often hard to see because trees often obscure the view. It is officially unnamed but has been dubbed Port Orford Point for the purposes of this guide. A short spur off of the main road drops down to the lakeshore and there are some great campsites here. From Lower Cliff Lake, the giant cirque surrounding Cliff Lake itself becomes apparent for the first time. Returning to the main road, proceed for another 0.3 miles to the north shore of Cliff Lake. The sound of the lake’s outlet creek should be audible before arriving at the lake. Shortly after passing Lower Cliff Lake the road crosses a corner of the private inholding mentioned previously. There is also an obvious gated dirt road splitting off of the main route. Please respect the owner’s privacy. Cliff Lake is a sublime vision of alpine splendor. The lake is large and deep and it is surrounded by cliffs on three sides. The cliff at the south end of the cirque emerges directly from the lake’s blue waters and climbs 1,500 feet to the summit of Many Lakes Mountain. Numerous snow-fed cascades crash down the face of the cliff and two large streams, falling precipitously out of Upper Cliff and Terrace Lakes also contribute to the symphony of cataracts. The scene is reminiscent of that found at Castle Lake, though the setting at Cliff Lake is much more intimate because the cliffs press in closer around the lake. Looking about halfway up the cliff, it is possible to make out a broad bench. This bench is accessible from Terrace Lake. Just to its right there is a bowl nestled into the upper reaches of the rocky cliff. 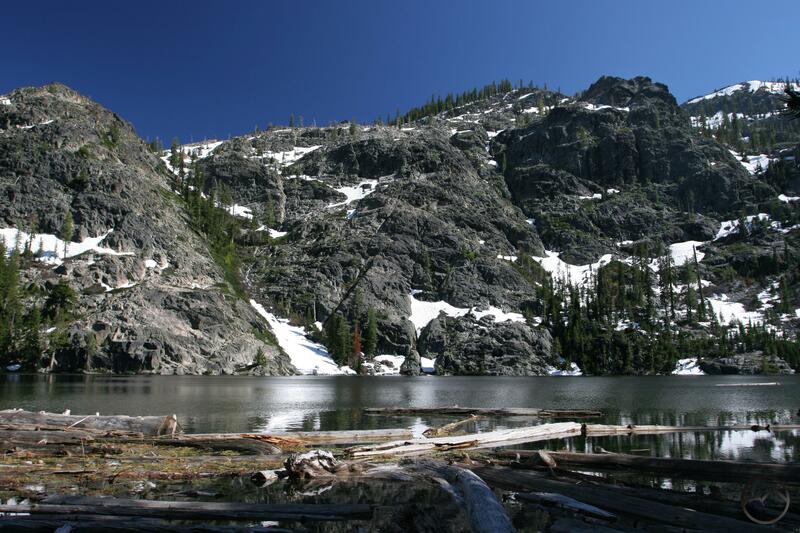 This is the uppermost cirque in Cedar Basin and is home to hard-to-reach Upper Cliff Lake. Be sure to remember that to the right of the road that leads to Cliff Lake is the private inholding. There are a couple of cabins and some outbuildings. Do not venture to this side of the lake. Instead, cross the lake’s outlet creek. There is a well-established use trail a few dozen feet south of the out. It is also possible to cross over the logs clogging the outlet. On the far side of the outlet creek there is a nice little campsite that has a very, very old school forest service fire pit. The rocks have been pile up and mortared together with chimney and a large piece of iron plate placed on top of the fire to form a griddle. Though there is only one here at Cliff Lake, there are several placed around the north end of beautiful Tangle Blue Lake in the nearby Trinity Alps. From the campsite, look east (this is to the left if one is facing the lake). There is a large trunk of a dead tree not far away. Close inspection will reveal a faint use trail just to the left of the trunk. This is the trail that leads up to Terrace Lake. The path is narrow and passes through pine mat manzanita, huckleberry oak and chinquapin. After about 0.5 miles and a few switchbacks the trail deposits one at the edge of Terrace Lake. The basin holding the lake is not nearly as rocky as the one holding Cliff Lake but it is still very pretty. The crest of the ridge that branches off of the main spine of the Trinity Divide and runs to the Castle Crags is visible behind the blue waters. The Pacific Crest Trail courses along the far side of this crest. There is a nifty view looking down on this basin just a few feet off of the trail. There are no established campsites here but it is a nice place to camp nonetheless. Looking down on Terrace Lake from the bench above Cliff Lake. From Terrace Lake, there is a cross-country route that leads to the west. 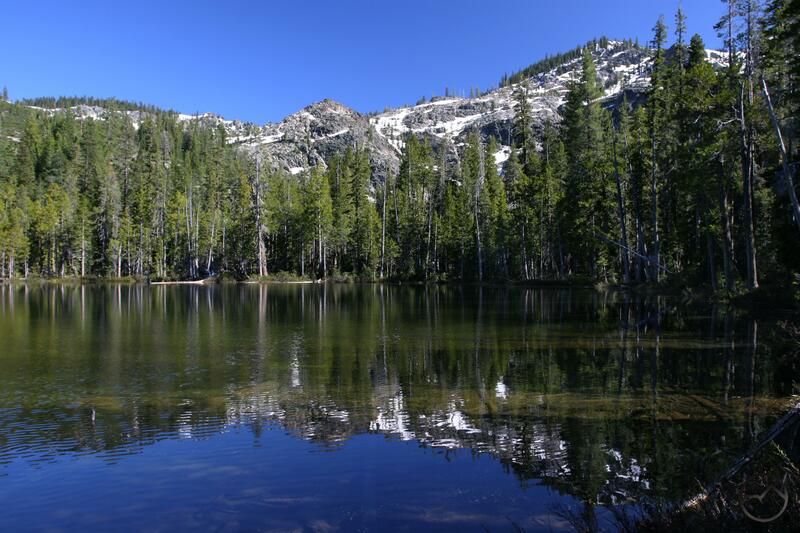 Climb up a rocky slope, angling southwest, toward the cliffs above Cliff Lake. This leads to the aforementioned bench, which is about 750-800 feet above Cliff Lake. While climbing up there are good views of Terrace Lake and Cliff Lake. Once up on the bench, continue to the west. Eventually one will come upon a small, nameless lake. It is a beautiful spot with a great view. Continue past the small tarn leads to the end of the bench. 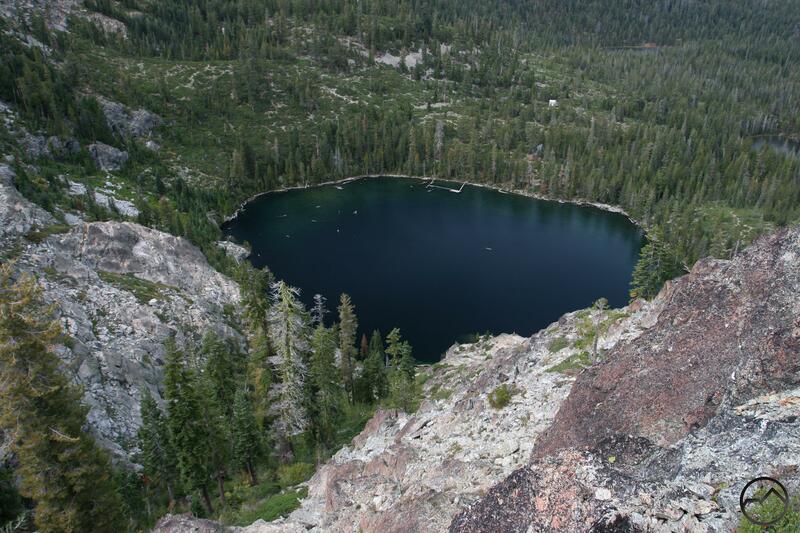 Here there is a chance to look down on Upper Cliff Lake, a gorgeous lake that few eyes see. Returning to Terrace Lake, one last bit of further exploration toward the ridgeline leads to two additional small, nameless lakes. They are surprisingly deep considering their small size. Cliff Lake cirque rises beyond Lower Cliff Lake. From the town of Mt. Shasta, head west on W. Lake, crossing over I-5. At the stop sign, turn left onto Old Stage Road. After 0.25 miles, veer right onto WA Barr Road. Continue south, crossing over the dam that impounds the Sacramento River and forms Lake Siskiyou. From the dam, continue 11.9 miles to the west, passing the lake and continuing up the Sacramento River. At 11.9 miles look for a dirt road veering off to the left. There is usually a painted blaze on a tree but there is no other identification of the turnoff. The dirt road does have a bit of climb to it and is surrounded by brush. It is only 30-40 feet up the road to the parking area. Me and my friends hiked this! We hiked in early spring and didn’t anticipate so much snow so we ended up hiking through the snow in shorts and tennis shoes! Still great nonetheless. The path was more like a dirt road rather than a trail and was relatively flat. We were the only ones there and the lake was absolutely beautiful! Another awesome thing about it was that you could tell at the top of your lungs and your voice would echo a few times! A wonderful easy hike aside from the short rocky part. Was thinking of exploring this lake tomorrow Is there much snow u think at that elevation. Love your website. Do you need 4 wheel drive to get to the start of the trail?